Beef 'O' Brady's - New Port Richey - Main St.
New Port Richey, Florida is on the west coast of the state of Florida on the Gulf of Mexico in Pasco County. It has beautiful beaches nearby that are quite popular with tourists who are visiting the state. New Port Richey is a bustling town that is near enough to Tampa that it can provide entertainment sources for anyone visiting there. New Port Richey, Florida has a tropical balmy weather pattern most of the time. During the summer months there are normally mid to late afternoon thunder storms, but most blow over quite quickly allowing the tourists to go on with their sight seeing plans. 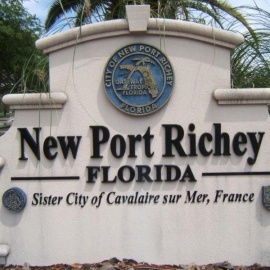 During the winter the area of New Port Richey, Florida is quite nice. There are approximately two weeks of chilly weather with a few frosts at night but the days during the winter months almost always warm up nicely, not even requiring the visitor to wear a jacket. The town of New Port Richey, Florida offers travelers many Five Star hotel accommodations with many offering beach front views. There are also smaller hotels inland that are less expensive and only a short drive from the beach. Dining in New Port Richey is all a matter of preference, as there are exclusive dining facilities and more casual eateries also. You will find vendor on or near the beach with hot dog stands and cold drinks, and at times there are vendors selling freshly caught fish from the Gulf of Mexico.